1000 thanks for your awesome feedback, Leanne! I came across an ad for zapptales on Instagram, I had actually said to my boyfriend Andrew only a few months before seeing it that I wished there was someway of keeping our whatsapp chats, so obviously when I saw your advert I was instantly intrigued. My book is the story of how me and my boyfriend got together….it is literally all of the conversations which we had from the day we first met to the day we moved in together. What was it like to create a book out of your own conversations? It was such an exciting feeling knowing that I was making a book full of some of the best memories of my life. The process of making the book was really simple and it was hilarious going through some of the messages which we had had at the beginning of our relationship. 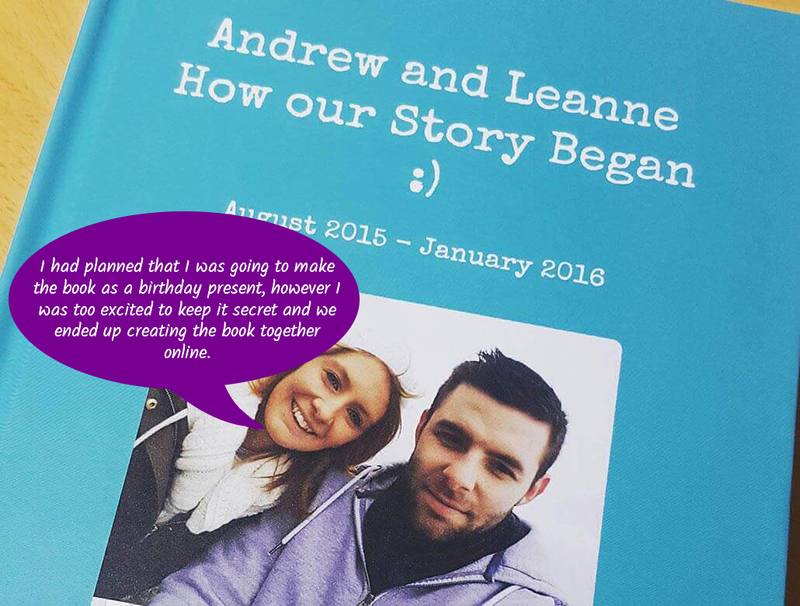 The book is a keepsake for Andrew and myself so we can look back on our earliest messages with each other. I had planned that I was going to make the book as a birthday present, however I was too excited to keep it secret and we ended up creating the book together online. What was the reaction of the person receiving the book? Andrew absolutely loved it! He could not believe the quality and high standard of the book. What is it you like about the book or our service? We both love the fact we have had the opportunity to preserve our earliest conversations and essentially the story of how our relationship started (and developed), without zapptales all of our WhatsApp messages would have been lost once we changed our phones. The website is easy to use and I love that you can choose specific time frames within the chat to make into the book. Its also really helpful that you can add in extra bits of text to the conversation when editing your chat (for example we did not have some of the images that we had sent each other due to deleting these from our phone, therefore I was able to add it little captions such as ‘cute quote was inserted her’, this means that our story still flows nicely). I have found your customer service team to be of an extremely high standard, my book was created and delivered much quicker than I had expected and having exchanged emails with your customer service team, I have nothing but good things to say about how helpful and polite they were when dealing with my enquiries. Such a great feedback from customers is the most beautiful praise and at the same time the greatest motivation for us! We are looking forward to hearing your opinion. The easiest way is to send an e-mail to info@zapptales.com, or contacting us via Facebook or Instagram. Since we want to constantly improve zapptales for you, we are also grateful for suggestions for improvement.